This (sucky) cell phone shot shows how far I am with Sock Scarf Two. I just turned the heels last night, and haven’t had much knitting time today. One thing about US#10-1/2 needles, it goes fast. I’ve taken a different approach with this one than with Sock Scarf One. You will recall that One was knit from toe to toe — one “sock” being knit toe up and the other “sock” knit top down. In the middle where the two “socks” meet, I knit a round of purls, and then offset the ribbing so that it looks like they’re seamed together a little crookedly. Sock Scarf Two is being knit just like socks, two at a time on double circs. 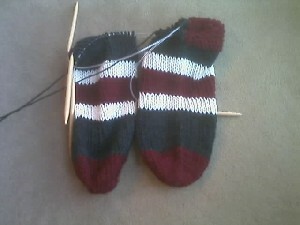 When the socks are 1/2 as long as I’d like the total length of the scarf to be, I’ll graft them together. One very nice thing about knitting long, multicolored tubes: the yarn ends don’t need to be woven in. Nobody will be able to see them. In other news, the recent Homeland Security decision to allow airline passengers to carry small scissors has been criticized by some airline pilots, flight attendants and the families of 911 victims. It has been greeted with wild enthusiasm by knitters everywhere.